Discover a more collaborative way to manage your projects and processes. Choose from our selection of free, downloadable business templates for Microsoft Office. We’re offering a roundup of Microsoft templates for Excel, Word and PowerPoint, all of which are customizable and easy to use. Organize your work schedule, manage projects and employees, streamline business processes, and create effective presentations. You’ll find a wide range of templates, including a sales plan, marketing calendar, business budget, SWOT analysis, invoices, meeting minutes and many more. Simply choose the template that best suits your needs, add your text or data, and print or share with your team online. These Microsoft templates are designed to help you save time while maintaining a professional appearance. We’ve also included templates in Smartsheet, a spreadsheet-inspired work execution platform that makes tracking, managing, and automating your projects and processes easier and more collaborative than Microsoft Excel, Word, and Powerpoint. This project management template includes a timeline, financial data, risk analysis, tracking report and more. 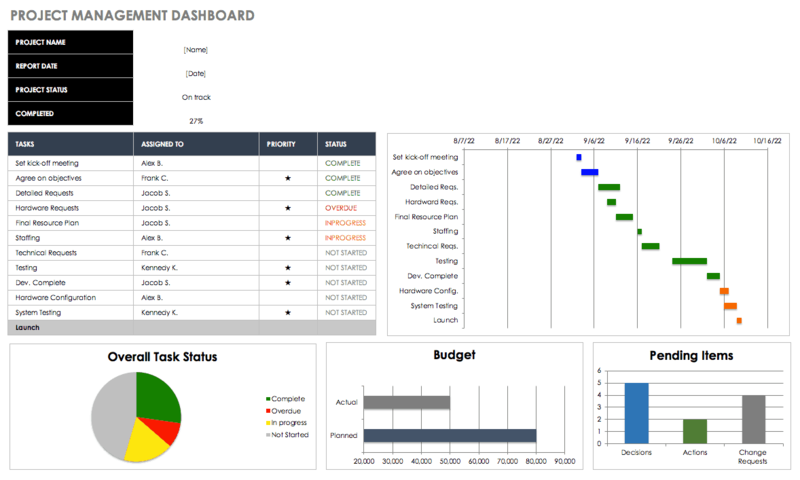 You get a quick overview of progress with the dashboard along with detailed information on task ownership, deadlines, budget and issues. Having a visual representation of data can assist in project planning and execution, and enhances communication and accountability among team members. 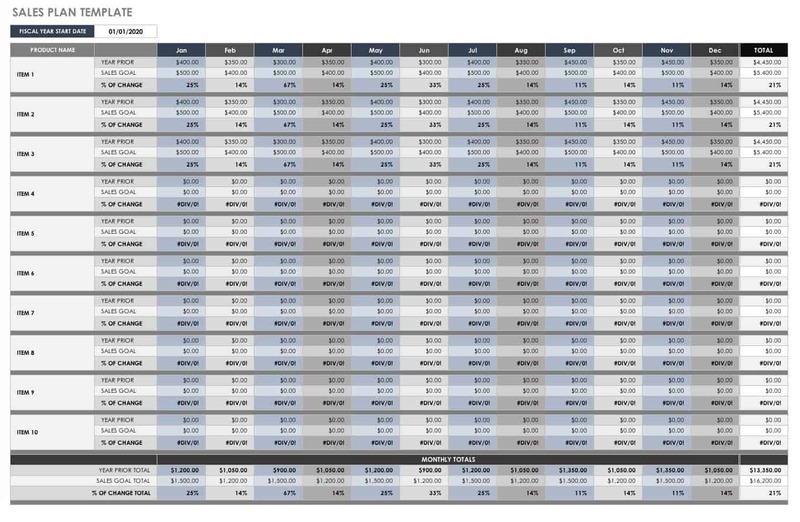 Create an annual sales plan with this free template. Identify your monthly sales goal for each product along with the previous year’s performance. The template calculates the percent of change for each month as well as monthly and annual totals. It’s designed to help you clarify sales goals and calculate financial data in one worksheet, complementing a more detailed strategic sales plan. This sales tracker template provides visual metrics for product revenue and lets you track data such as shipping charges, percent markup, profit per item and total income. Use this template to find out what percentage of your sales revenue is coming from which products. 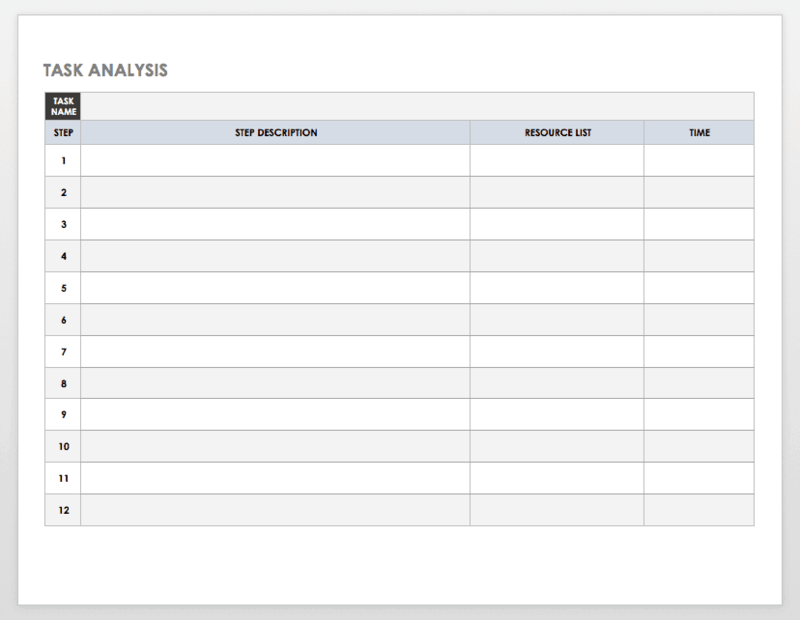 A sales tracker template is useful for online sales, retail and small businesses. 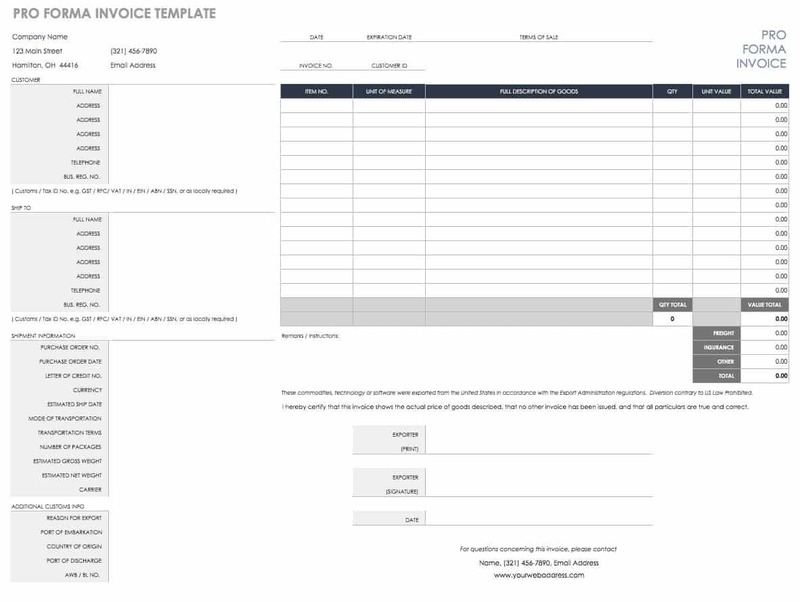 This service invoice template includes columns for describing each part of the work performed, hours completed, and pay rate. The template shows clients an itemized list of charges, and it calculates the subtotal as well as the total amount due after tax. There is also room at the bottom of the invoice for additional instructions if needed. 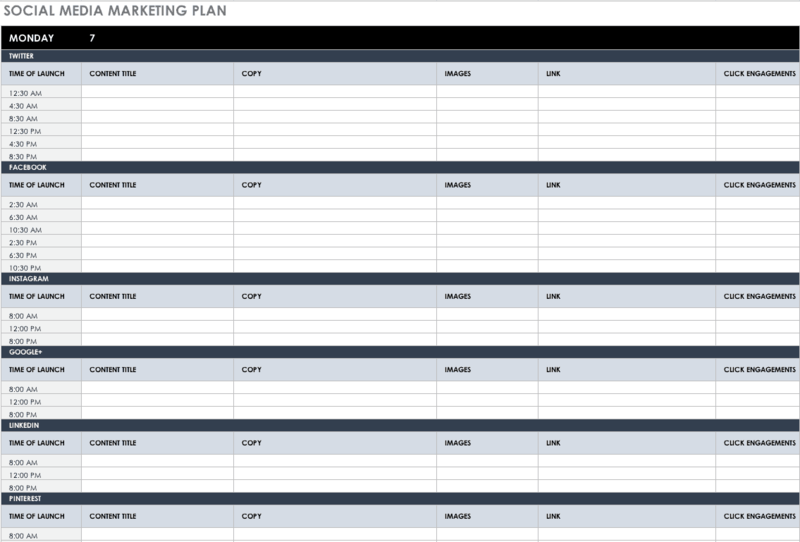 This editorial calendar template provides an annual view of your marketing plan as well as detailed reports for each month. Track important holidays, seasons, launches, deadlines and goals, and measure the success of your marketing efforts. Each monthly spreadsheet includes columns for project descriptions, ownership, target audience, release dates, metadata and more. Optimize your business budget by tracking income and expenses. Creating an itemized budget is an essential part of business planning and informs your goals and business strategy. Simply enter your data and the template will calculate totals as well as the difference between your projected budget and actual costs. This employee schedule template is divided by days of the week and hours from 7:00 a.m. to 7:00 p.m. List each employee’s name and the department they will be working under during certain hours. The template will then calculate the total hours worked per day for each employee. Managers can use this template for schedule planning and then print and share it with employees. 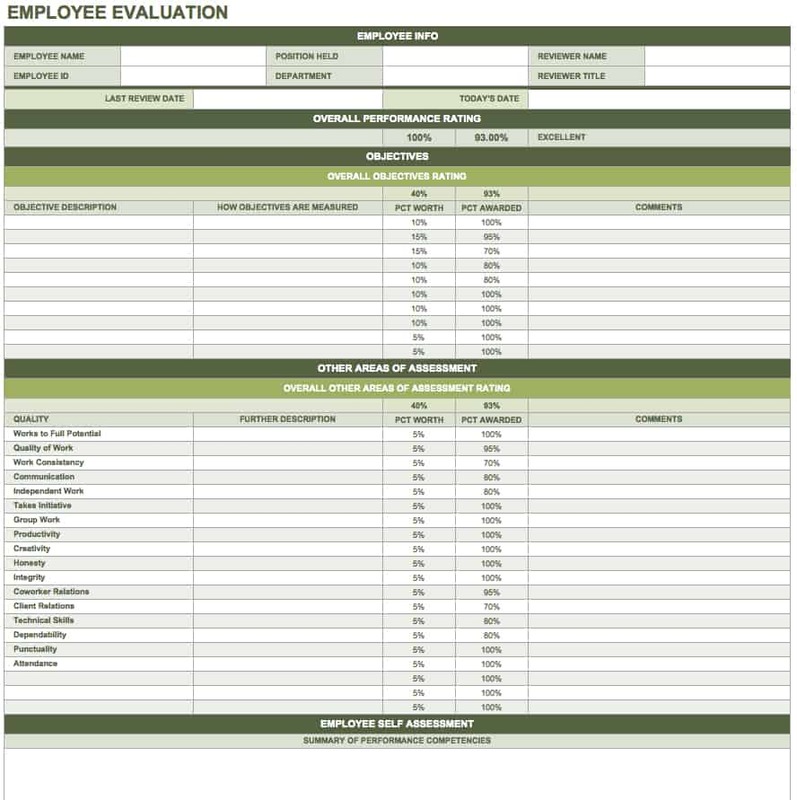 Streamline your employee evaluation process with a preformatted template. Document work performance, future objectives, employee feedback or any other pertinent elements. Use the template as is or customize it to suit your needs, whether you’re conducting manager or employee evaluations, or even self-evaluations. 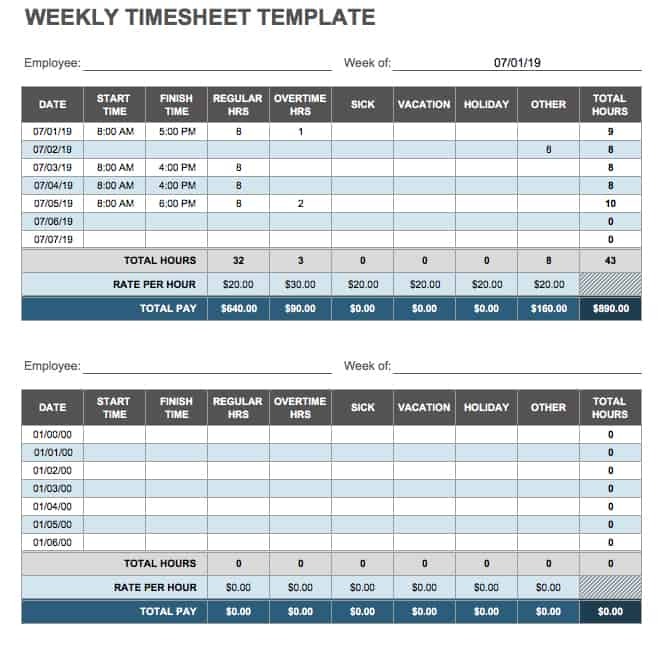 This timesheet template documents daily and total hours worked, regular and overtime hours, sick leave and vacation days, pay rate, and the total amount earned. This is a simple timesheet template for calculating employee work hours and income. Use it to track employee performance and labor costs. 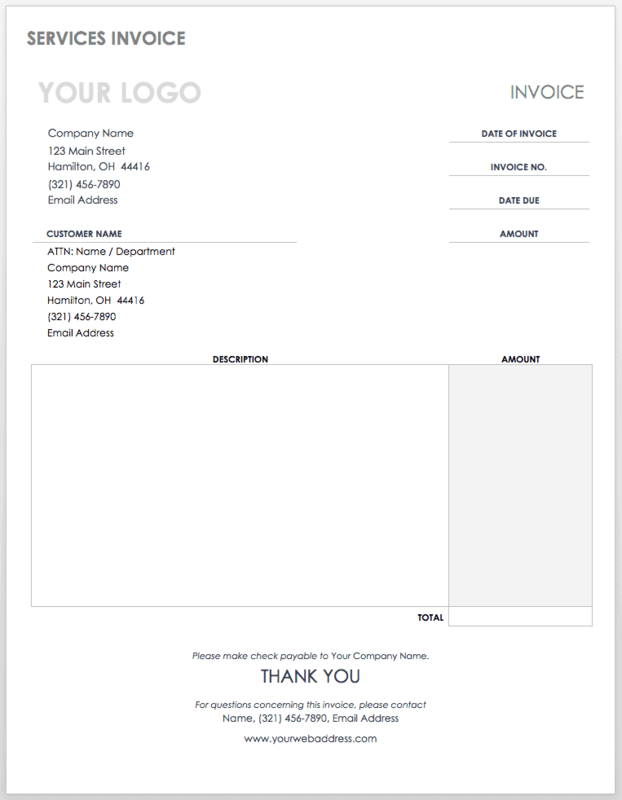 As a complement to a sales invoice, a packing slip template provides information about the products you are shipping and the sales transaction. It’s a helpful document for customers, especially if you are shipping a large quantity of wholesale items. A packing slip can also be useful for reducing errors during packing and shipping. Create a professional job estimate for clients by listing materials used, a description of the work to be performed, labor hours and total costs. A job estimate template may be used by construction contractors, consultants or freelancers to give potential customers a clear idea of project costs. This template can also be used as a job invoice after work has been completed. Social media is part of your broader digital marketing plan, but having a schedule template specifically devoted to social planning can help you manage your presence on multiple channels. Plan your content, including copy and images, create a publishing schedule, and track click engagements. The template is divided into 30-minute intervals, which allows you to plan posts throughout the day. Plan your workday as well as personal activities with a daily planner template. The hours of each day are divided into 15-minute intervals for detailed planning, and sections are included for important tasks and additional notes. If needed, you can easily edit the planner to highlight appointments, errands, meetings or other tasks. 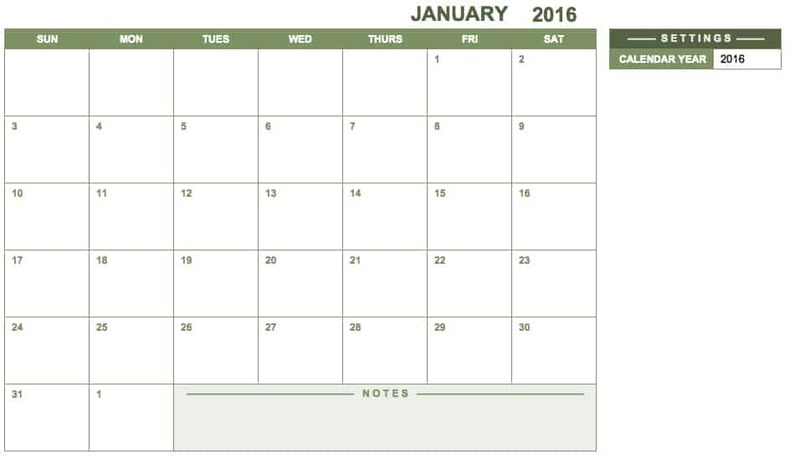 Use this 12-month calendar for any year - just choose your prefered year, and the calendar dates will update automatically. Each month is displayed on a separate spreadsheet within the template, and the calendar view provides a monthly snapshot as well as room for daily details. There is also a section for notes at the bottom of each calendar. 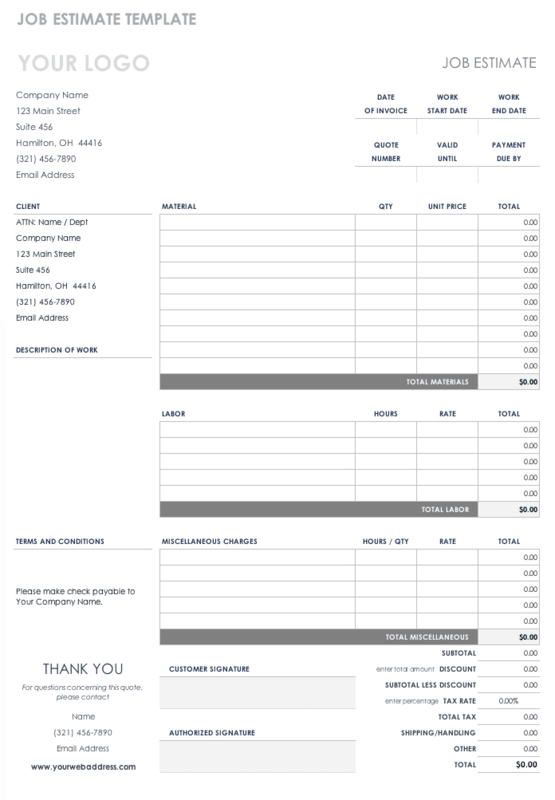 Customize this sales invoice template with your company logo and address, then add billing and shipping info, plus item descriptions and prices. The template will calculate a subtotal along with a sales total after tax and shipping are added. 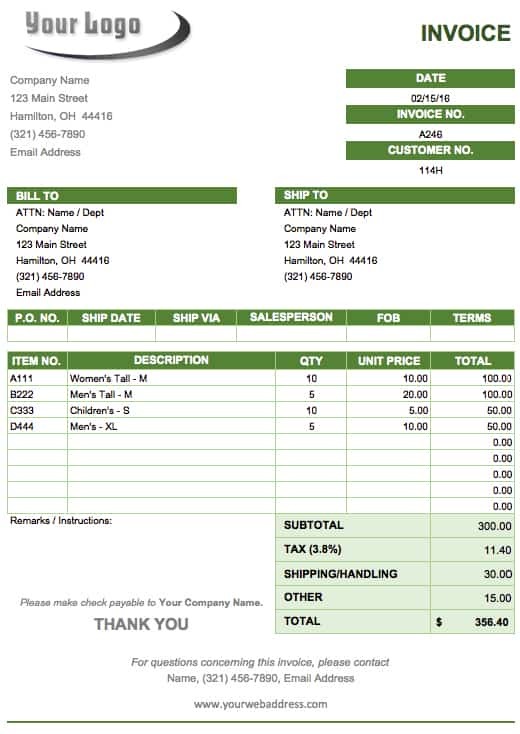 Use the invoice and customer numbers to keep track of sales transactions. 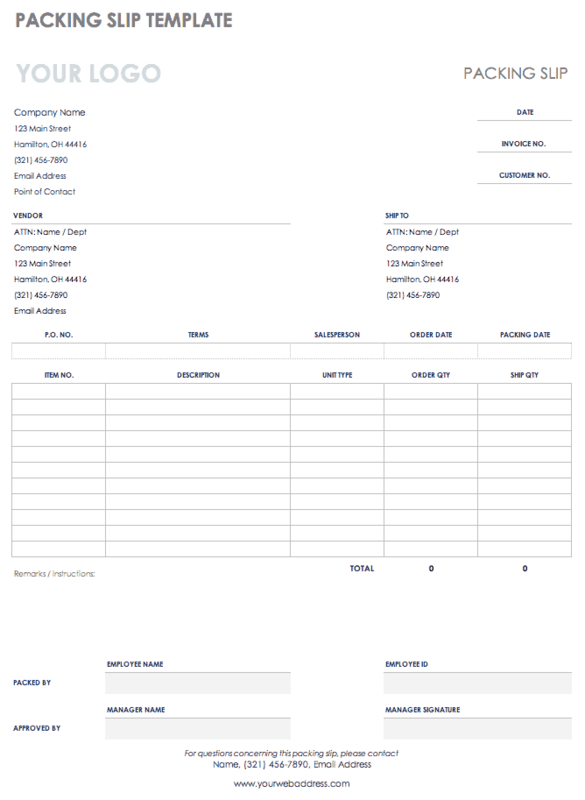 If you need a pro forma invoice for international trade or a planned business transaction, this template includes all of the necessary elements. List export information, freight type, item descriptions and weight, and value. The invoice also calculates costs, including tax and insurance. This pro forma invoice is appropriate for packages going through customs, but it can also be edited for your specific needs. 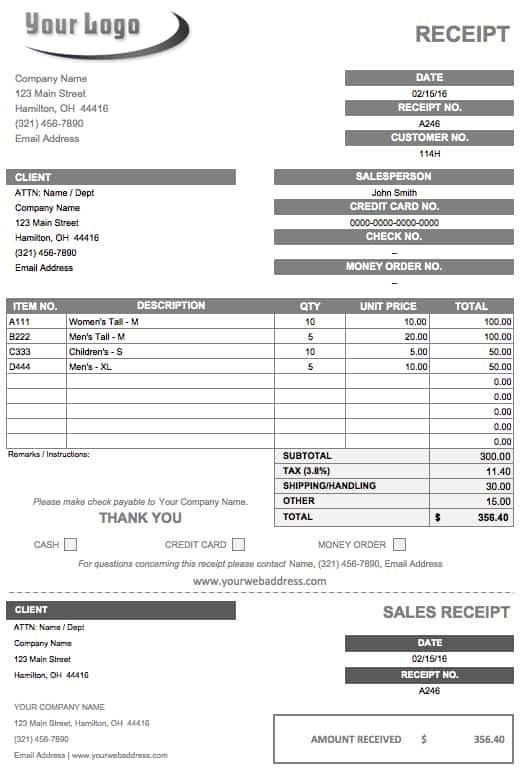 If you need to provide customers with a sales receipt, this template shows an itemized list of items purchased, and the cost for each item as well as the total cost, including tax and shipping. If you don’t need to include those charges, simply delete them from the template. The receipt also shows the method of payment used and the date of the transaction. 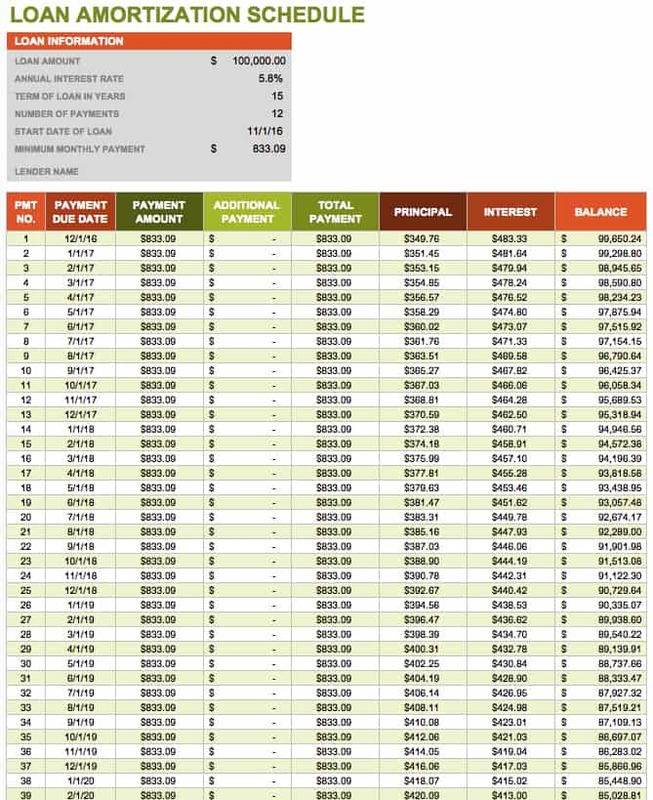 This loan amortization template includes columns for payment due dates, additional payments, principal, interest and loan balance. Loan information is shown at the top, including interest rate and loan starting date. You can keep track of business loan or mortgage payments with this amortization schedule. Save time and help ensure success on your next design project with a creative brief template. This template has a simple layout and is easy to read, fostering communication with clients and highlighting crucial information. A creative brief is not merely a formality - it clarifies the client’s objectives and helps prevent the need for multiple revisions during a project. 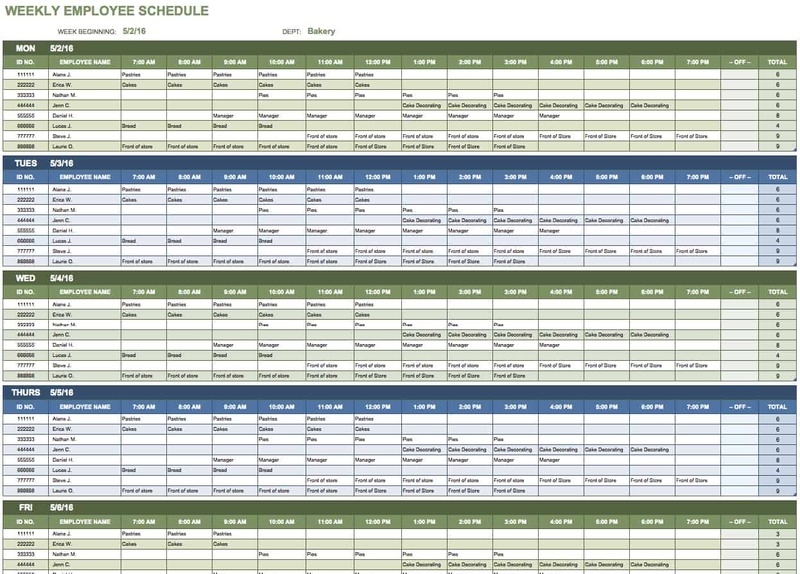 Organize your business meeting agenda and share it with attendees in advance so that they come to the meeting prepared. Creating a set schedule for your meeting agenda can keep participants on track, provide structure, and prioritize objectives. 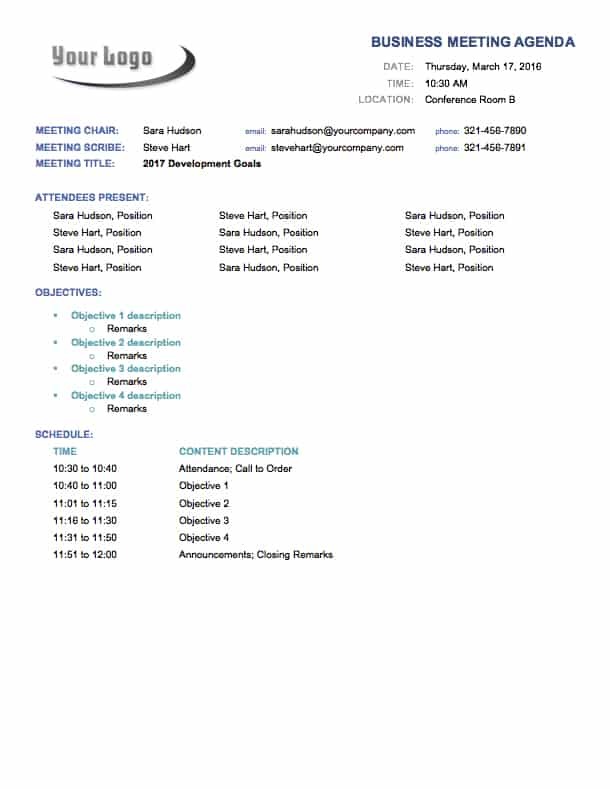 This agenda template can also serve as a reference document, showing who was in attendance, the meeting date and location, and other important info. 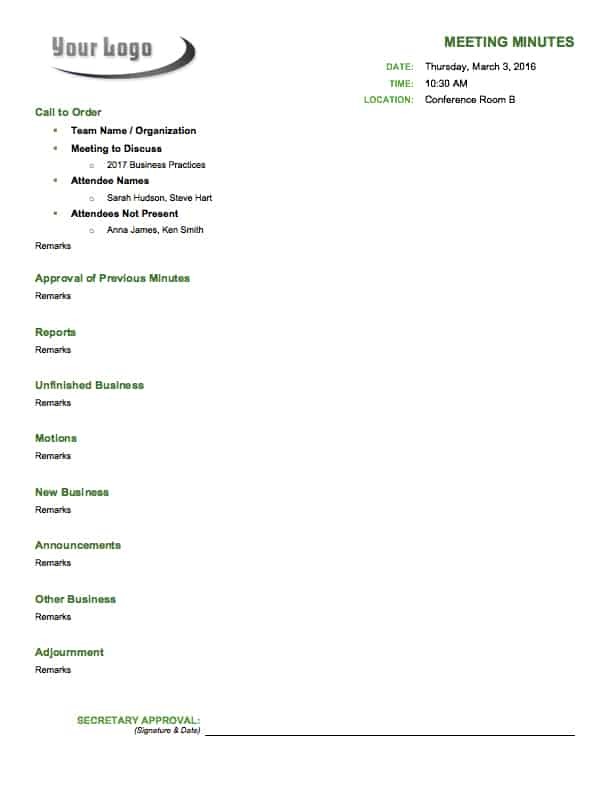 This meeting minutes template provides a basic outline for documenting the proceedings of a business meeting. It can also be used for meeting minutes at a club, school or other organization. The template includes a signature line at the end for secretary approval. This weekly schedule template covers 24 hours, so you can use it to create a work schedule for daytime hours, swing shifts, or graveyard shifts. It also includes a full week, from Sunday to Saturday. You can edit the template to only include the hours you need, and print the schedule to fill out by hand or share with others. 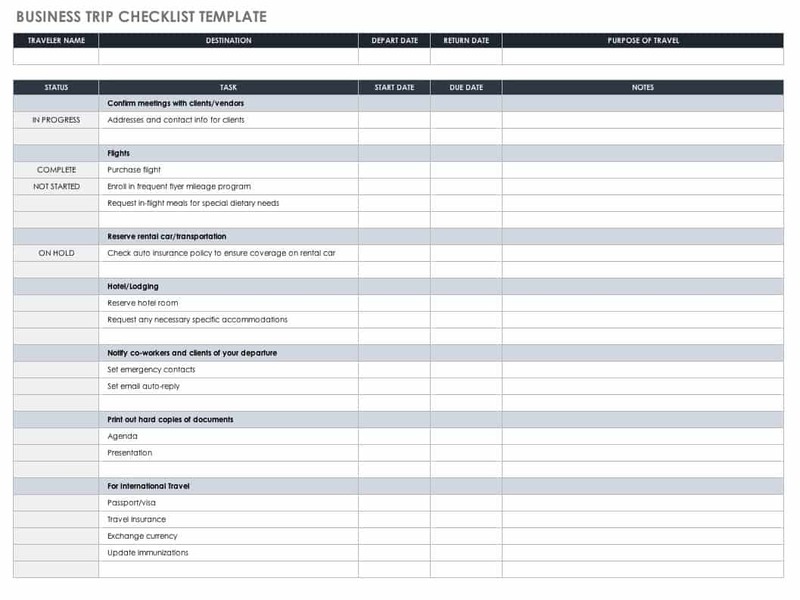 Prepare for your next business trip with this checklist template. The template includes sections for work, home, packing and other tasks to cover all your bases. Even a simple checklist can alleviate stress, prevent forgotten business or travel items, and ensure that everything is taken care of while you are gone. An action plan template can help you turn your business objectives into clearly defined, actionable steps. 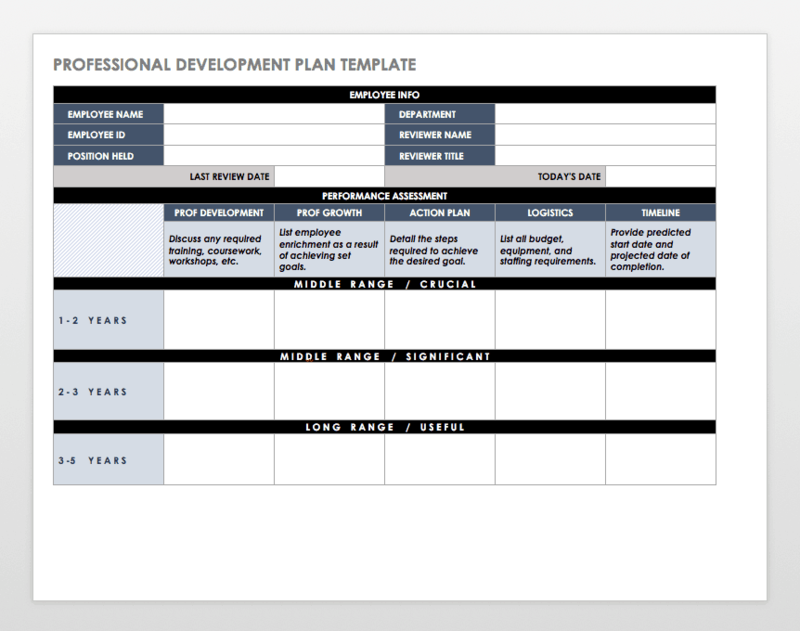 This template allows you to make an action plan for multiple goals or phases of a project. List your action items, responsible parties, start and end dates, and the resources required to complete each task. There is also a section for notes where you can monitor progress or address issues. 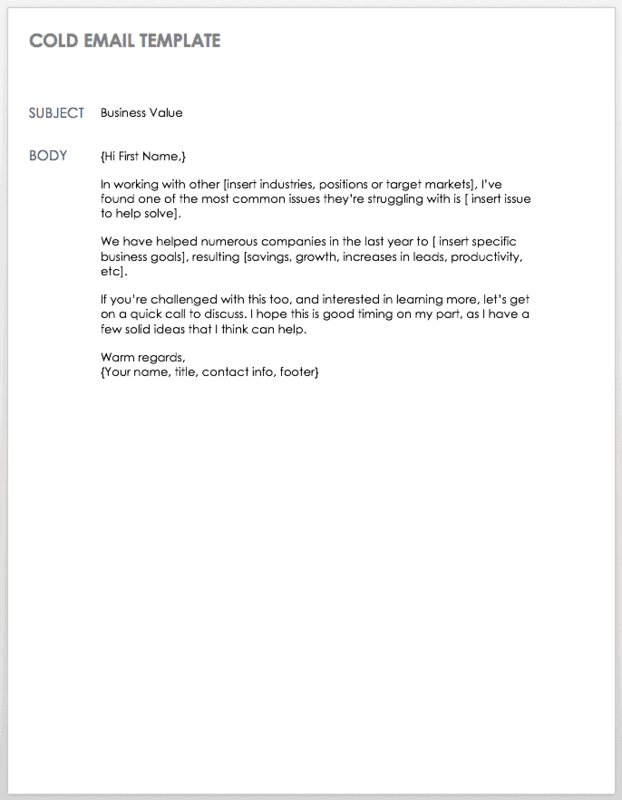 This cold email template gets right to the point, initiating contact and emphasizing your value proposition. To use the template, fill in the relevant information regarding your business and the prospective client, and copy and paste it into an email message. 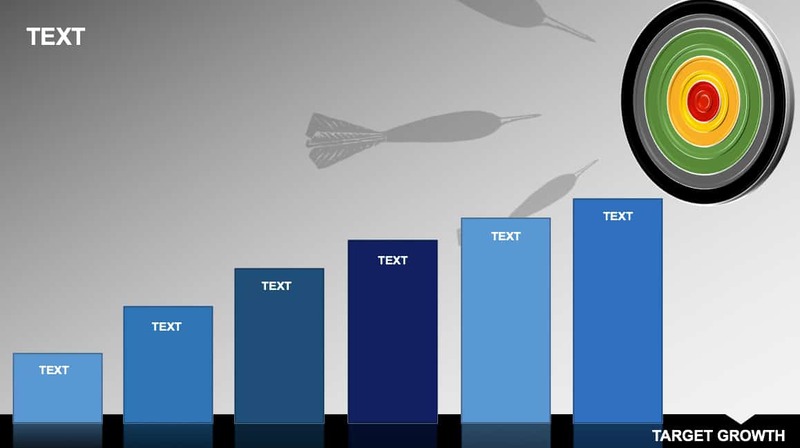 Edit the template as needed to create effective email messages for new leads. Professional development is valuable not only for the career prospects of employees, but also for employers - it encourages employee retention, aids succession planning, and helps prepare businesses for future demands. Encouraging professional development requires more than just a template, but this document is an important part of the process. Use it to create an action plan for reaching both short-term and long-term goals. Use this template to analyze the steps and resources required to complete a work task. Once you have listed the incremental steps along with the time spent on each one - as well as the financial, operational or human resources involved - you can develop a thorough analysis. This is useful for training employees or evaluating business processes. 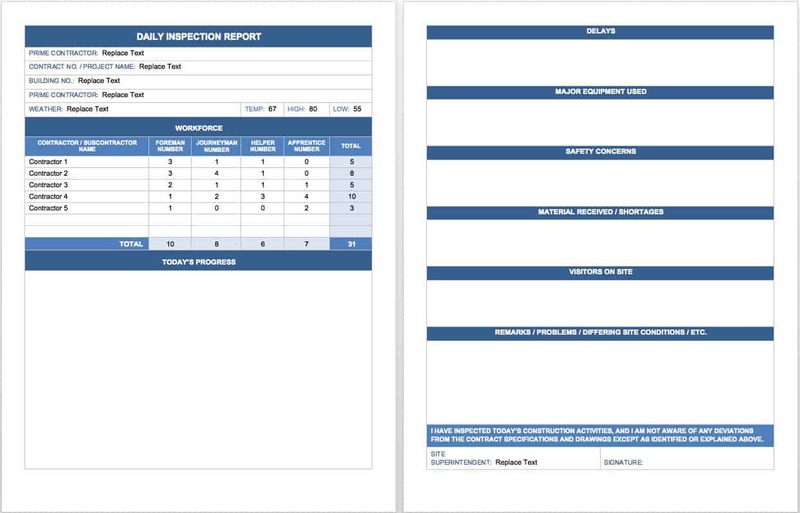 This inspection report template is suitable for construction contractors who need to document worksite conditions, safety issues, equipment usage, visitors and other information. Subcontractors are listed at the top along with total workforce numbers. This template can be used for a daily inspection report, and can easily be adapted for different projects. 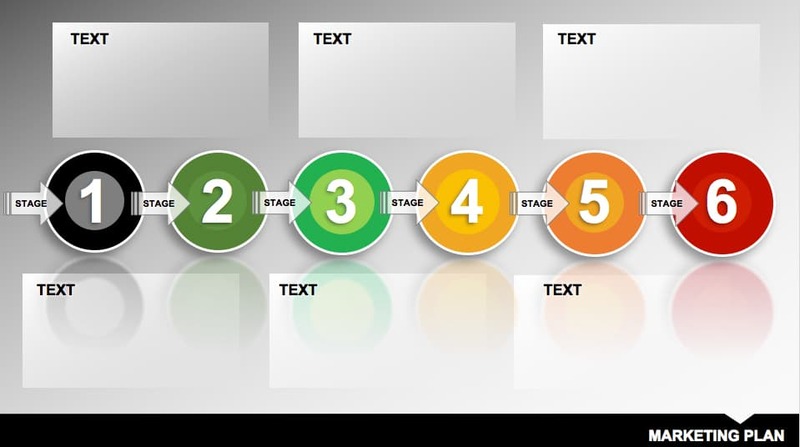 Present your marketing plan by highlighting each stage of the process. This is a simple PPT template with plenty of room for text along with visuals to capture the attention of viewers. 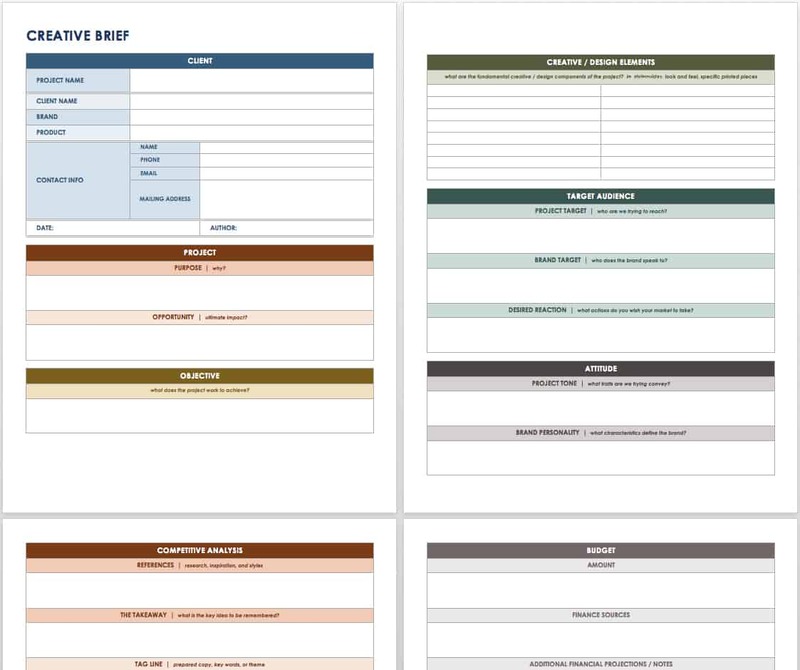 This template provides a summary of your marketing plan to share with team members or clients. Use this SWOT analysis template to list strengths, weaknesses, opportunities and threats for your business or project. Analyzing internal and external factors affecting your objective can help you determine a strategy and create an action plan. 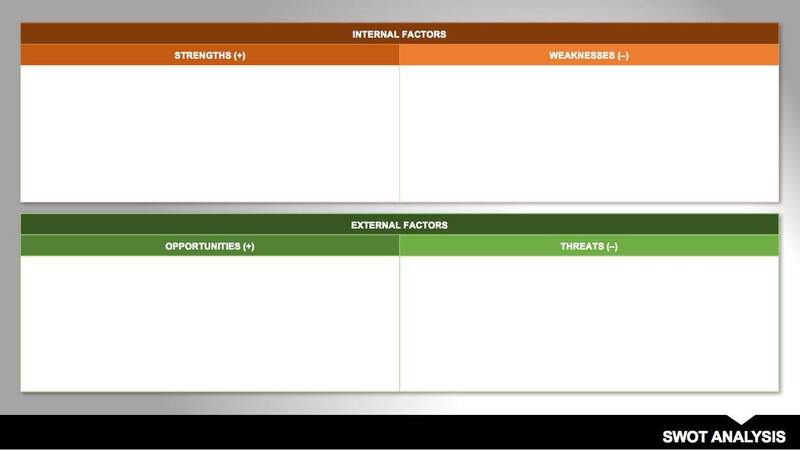 This template offers the traditional SWOT matrix format for viewing all factors side-by-side. Prioritize your business goals with an eye-catching template that’s also easy to read. Each objective is associated with a part of the target, from lower priority to bullseye. This template creates a bold statement about which goals should be focused on first. 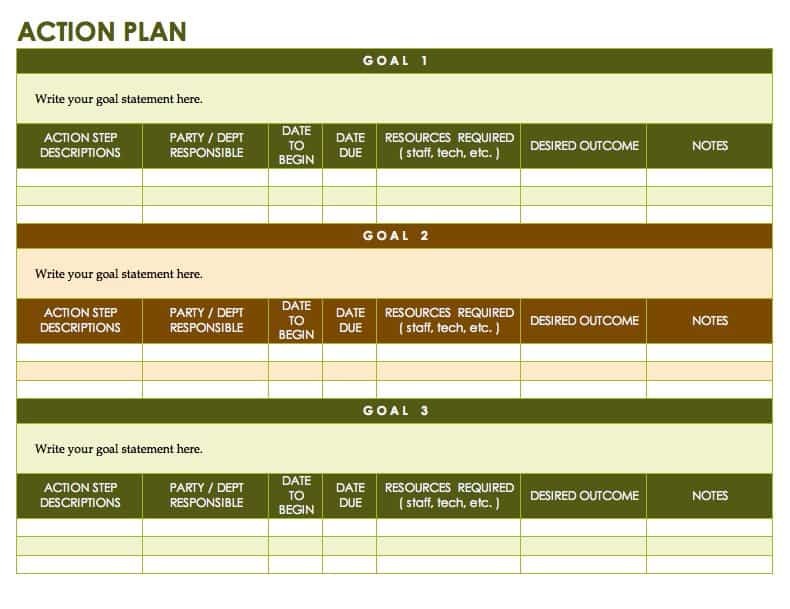 This target growth template illustrates a projected growth plan or target objectives. 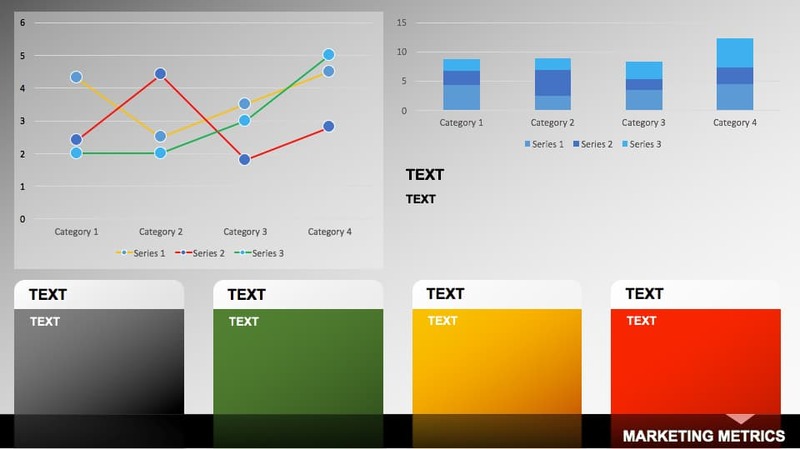 Use it to create a colorful presentation highlighting specific goals. The template could also be used for reporting data on previous growth or accomplishments over time. 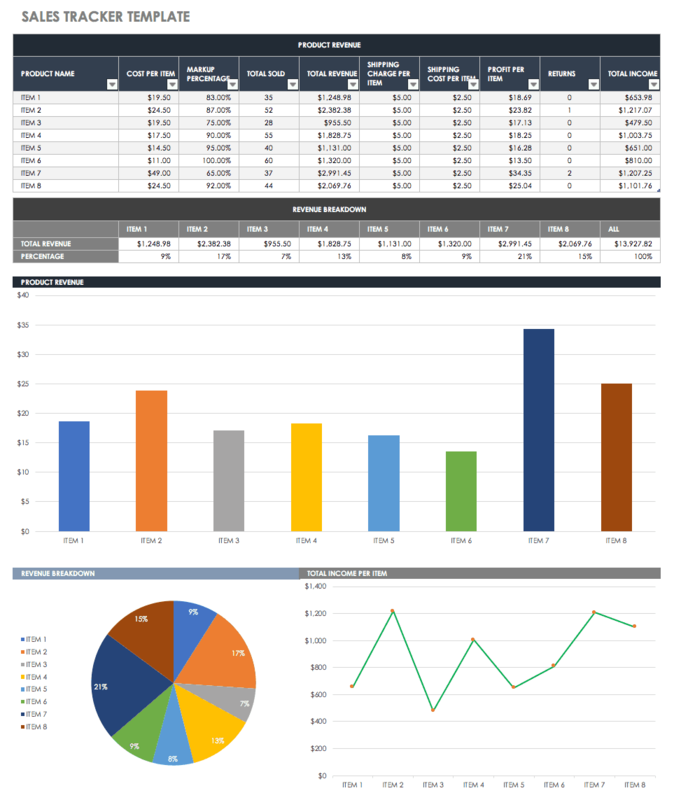 This template presents financial data both as an itemized list and in graphic charts. 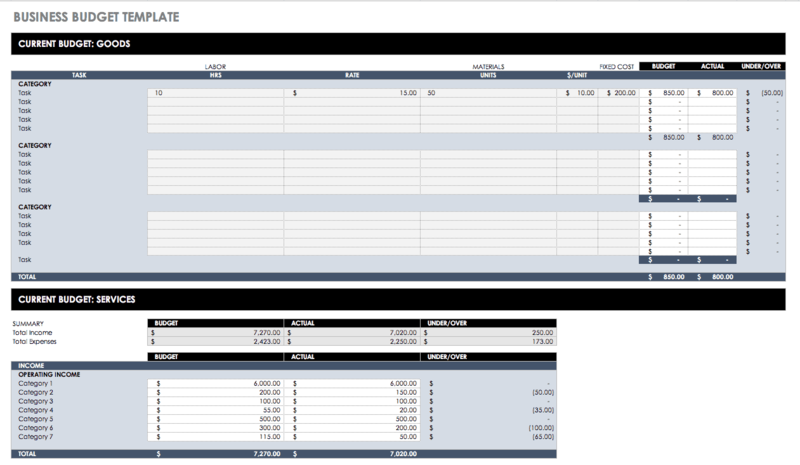 Use this template for reporting assets, tracking expenses, budget planning, or other financial planning. You can adjust the template to accommodate your specific needs. 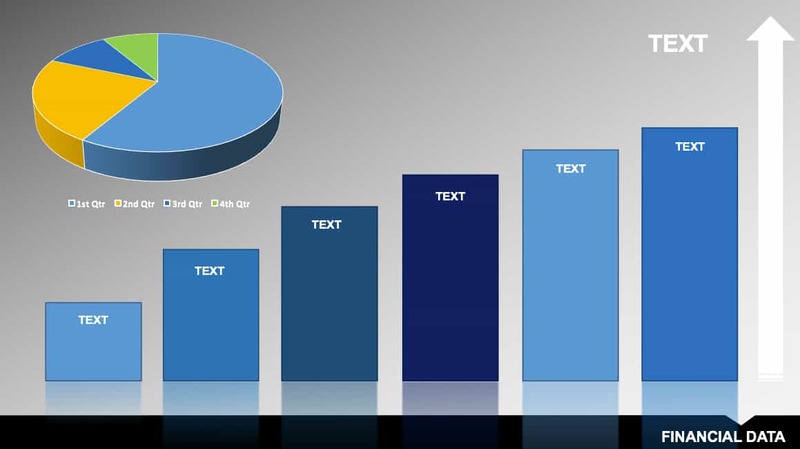 This marketing template provides a visual representation of metrics for measuring the success of various campaigns. Track which campaigns are most successful, and adjust your marketing plan to account for less successful efforts. This is a useful template that is also well suited for presentations. Use this template for comparing business performance in different areas. You could examine customer satisfaction, the productivity of business operations, employee training outcomes, or any measurable factors that you want to assess side-by-side. The measurement sliders included in this template are large enough to create a bold visual impact. 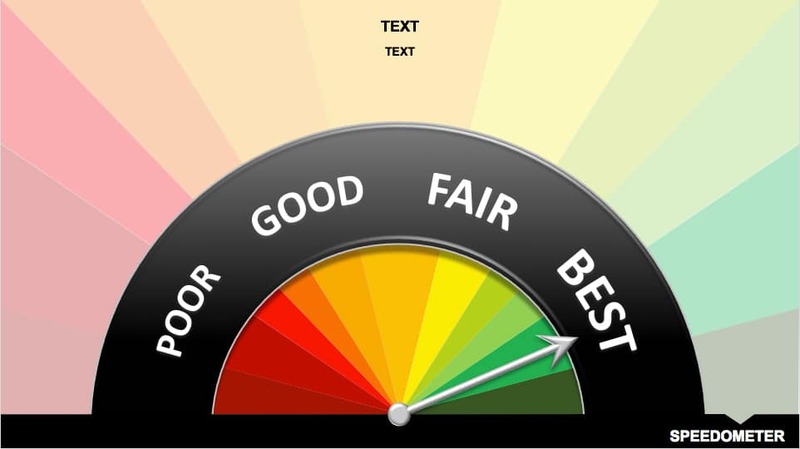 This speedometer chart template offers another method for measuring success. 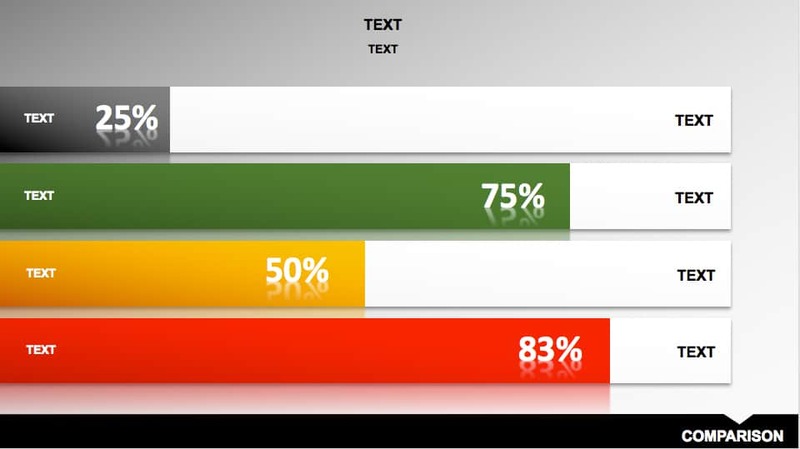 Add your text to the template to illustrate which areas are performing best and which need the most attention. 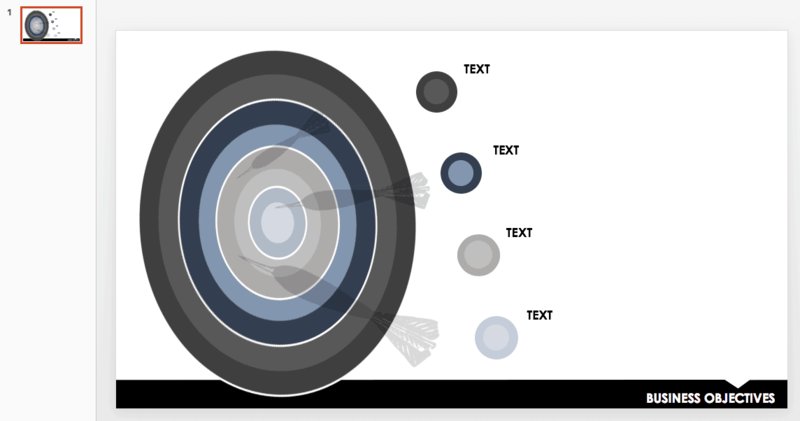 Providing a visual assessment chart can create a stronger impression with viewers when presenting any data. 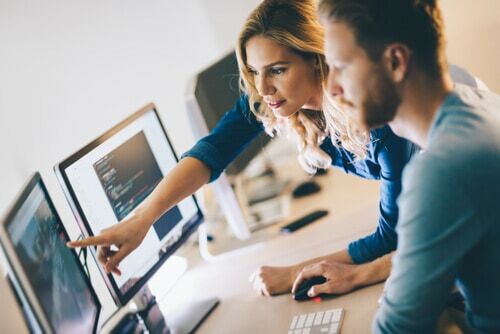 Streamlining business processes, managing workflows, and enabling cross-functional collaboration is the key to the success of your projects and processes. To ensure that your team reaches its goals and objectives in the most efficient way, consider using a tool that enables you to plan, manage, automate, and report on projects and processes in real-time, in one centralized location. Smartsheet is an enterprise work execution platform that is fundamentally changing the way businesses and teams work. Over 74,000 brands and millions of information workers trust Smartsheet to help them accelerate business execution and address the volume and velocity of today's collaborative work. The familiar Smartsheet interface that is designed for how people actually work leads to rapid and broad adoption across your organization. Use self-service reports and dashboards in Smartsheet to provide real-time visibility into resources, status, and performance, so you can rapidly align operations with strategy. 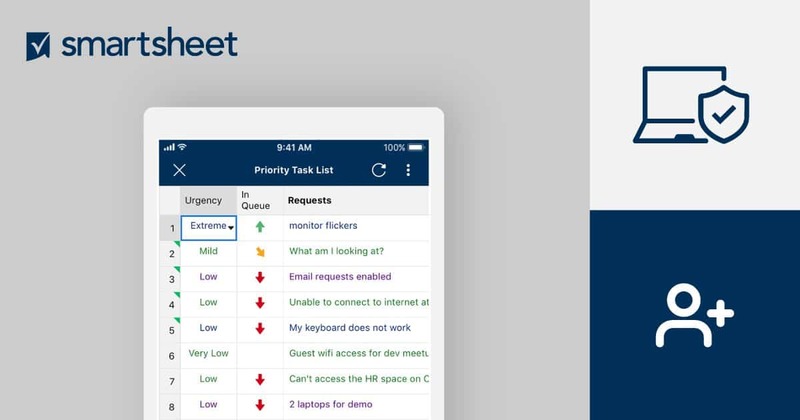 Try Smartsheet to discover why millions of professionals around the world use it to move from idea to impact, fast. Discover the top ten ways to increase business productivity. Learn how to pick the right Excel alternative for your company with this quick overview. 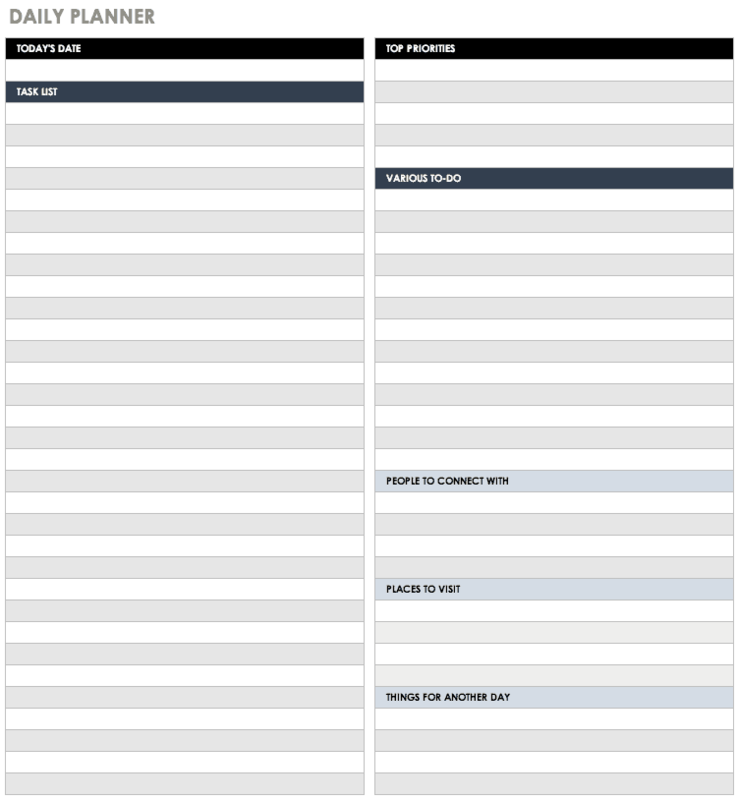 Track and manage your business or personal projects with these free templates.